Trailhead and parking area are on the Kancamagus Highway in Lincoln, NH (summit is in Franconia). Park at the very large Lincoln Woods Visitor Center parking, on the north side of the road, 5.1 miles east of Rt. 93 at exit 32. Ridge-like Owl's Head Mountain stands alone in the western Pemigewasset Wilderness, surrounded by long valleys on all sides. Its summit, completely forested and isolated over nine miles by trail from the nearest road, Owl's Head is by far the most hated mountain of all the New Hampshire 4000-footers. It is not a mountain to be hiked by anyone but those pursuing the list. However, many hikers say the sights to see on the hike to Owl's Head are worth the trip. The wonderful remote feeling of the mountain is enough to justify the length of the trip to many nature-loving peak-baggers. The mountain is not entirely viewless, too. The trail to the summit climbs a slide which is completely open at elevations of 2800-3000 feet and provides wide views of the Franconia Range. The rest of the route, much of which uses old railroad beds, is easy walking and follows several picturesque rivers and streams through the wilderness. This hike involves two major river crossings and should not be attempted when water is high. The lengthy trek begins at the Lincoln Woods parking area. Walk to the end of the parking area and onto the deck of the visitor center. Turn left at the trail signs and walk down the stairs onto a gravel connecting path. Turn left, then right and cross the iconic suspension bridge over the East Branch of the Pemigewasset River, a much larger and wilder waterway than the "main" branch of the Pemigewasset River. On the other side, turn right and follow the very wide and flat Lincoln Woods Trail as it follows the East Branch on the bed of an old logging railroad, last operated in 1948. The first mile is mostly over graded surface, but soon after, the pathway becomes studded with railroad ties. At 0.7 miles, the trail goes along a fence atop a washed-out bank, which provides a nice spot to look out over the river. Just beyond, the trail passes over Osseo Brook as it drains into the East Branch and proceeds to parallel it. The trail continues next to Osseo Brook for 0.6 miles before the brook diverges to the left, followed by the Osseo Trail. At this junction is an informative sign about logging artifacts which may be found in the forest. Just after this, the trail passes a clearing from a logging camp on the left. In another 0.2 miles, the trail reaches its second viewpoint over the river, next to a long piece of rail. Bondcliff's south spur rises prominently above the river, with the summit of Bondcliff to its left. The trail then crosses Birch Island Brook on a bridge and continues very straight for 0.9 miles. After this section, Black Pond Trail goes left. A short distance past this, two signs mark a 200-foot interval where hikers are given the opportunity to measure their stride. Franconia Falls Trail goes left soon after (0.3 miles since Black Pond Trail), and Lincoln Woods Trail crosses a bridge over Franconia Brook built around the remains of a railroad trestle, enters the Pemigewasset Wilderness, and dead-ends at a fork. Here, Franoncia Brook Trail forks left, while Bondcliff Trail goes right. Bear left onto Franconia Brook Trail as it climbs a small hill, then continues the railroad grade walking, although now on a much narrower wilderness footpath. In just over half a mile, the trail makes two crossings of Camp 9 Brook. After another easy half mile, the trail turns right as the railroad grade continues into a swamp. In 0.2 miles, the trail crosses Camp 9 Brook for the final time, then makes a short climb and rejoins the railroad grade in another 0.1 miles. Continue another 0.4 miles to a trail junction. To make a quick side trip to a pond with a view up Bondcliff's west ridge, continue straight for less than 0.1 miles. To continue on the hike, turn left onto Lincoln Brook Trail. This trail winds through the forest for half a mile before crossing Franconia Brook. This crossing, one of two major river crossings, is always very difficult, even in the dry season. Take time to plan a route across. The largest rocks are found to the left. If the task of rock-hopping across a rushing river seems terrifying, you may want to pack water shoes or sandals to wade across. If you decide to do this, it is also a good idea to leave them on until you cross the next river. After a gentle 0.4-mile climb, the trail crosses Lincoln Brook, the other major crossing. This river is smaller, but lacks the quantity of large, stable rocks that aid the crossing of Franconia Brook, so it is equally difficult. The trail now climbs gradually up the Lincoln Brook valley, closely following the brook for the next 1.3 miles. It is much rougher in this section, as it travels across the fairly steep slope dropping down to the brook, with many minor ups-and-downs. Many scenic cascades can be seen in the brook below. At the end of this section, the trail crosses an unnamed brook as it empties into Lincoln Brook. It then heads away from the river and follows a deteriorating section of railroad grade, filled with mud and rotting logs, for the next 0.6 miles. At this point, the trail crosses Liberty Brook, then switchbacks up the bank, passing a logging camp clearing. The trail descends gradually for 0.2 miles back to Lincoln Brook to cross it again. This is a significant crossing, but it is not nearly as difficult as the crossing downstream where the river is much larger. In the final 0.4-mile section on this trail, it climbs near the bank of the river, then slowly splits away, soon reaching the gravel from the Owl's Head Slide. Turn right onto Owl's Head Path at a junction marked only with large cairns. 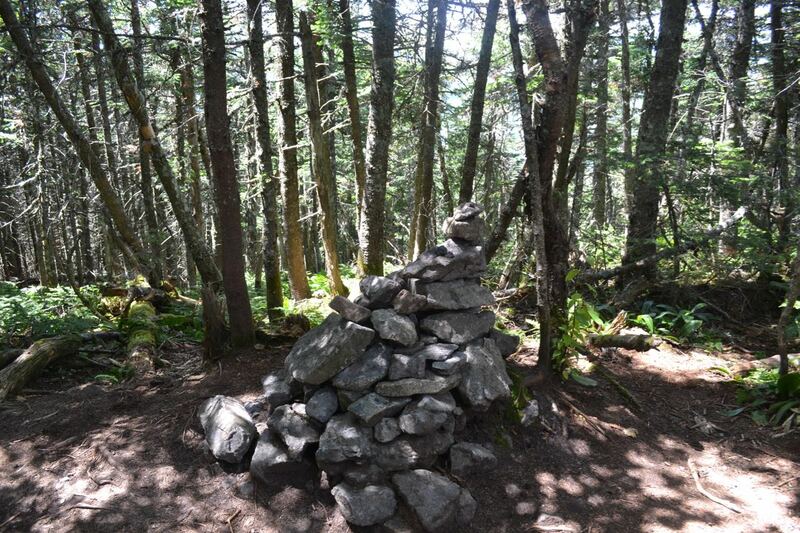 This trail is a bushwhack route which has received so much traffic that it has become an easy-to-follow herd path and has earned a description in the AMC White Mountain Guide. The path quickly begins to climb along the wet lower part of the slide, soon becoming quite steep and emerging in the open. The path, marked occasionally by cairns, winds up the loose rock and gravel of the slide for 0.3 miles, with lots of rock scrambles, before reaching a flat ledge on the left side of the slide which provides the highest and most open viewpoint. To the far left, Mt. Flume pokes above the trees at the edge of the slide. Next over, a long ridge leads up from the valley to Mt. Liberty. Close by is a nameless hill in the forest. Far above, the Franconia Ridge begins at minor Little Haystack Mountain and leads up to Mt. Lincoln. The slide provides an excellent perspective of the V-shaped Lincoln Slide, between Mt. Lincoln and the small bump known as Truman Peak. To the right is Mt. Lafayette, the highest point in the range. From there, the ridge curves down to Mt. Garfield, just out of sight all the way to the right. In addition to the mountain view, the look straight down into the Lincoln Brook valley is quite nice as well. From the view ledge, the path continues up the slide into the forest, still climbing steeply over loose rock. Water usually runs over this section of the trail until you pass a spring coming out of the rock. After another steep, straight pitch, the trail reaches the top of the slide and turns left, then right and continues slightly less steeply up. The grade slowly eases the further you go, until, after a half mile of climbing, the trail reaches the plateau atop Owl's Head. The path then weaves around the ridge top, running mostly flat for 0.2 miles to the "old summit", a point which until 2005 was thought to be the summit of the mountain. The path then continues along the ridge for another 0.2 miles, passing a blowdown patch with a minor view through the trees at the Franconias, then ascends to the summit, marked by a large cairn. Tree-climbing has been suggested as a method of obtaining views from the summit, but the dead limbs and dense nature of the fir trees here leaves hikers with only the solitude of the forest.